It was all smiles and hugs when Seahawks safety Kam Chancellor turned up at training Wednesday to end his lockout after a night flight from Los Angeles. 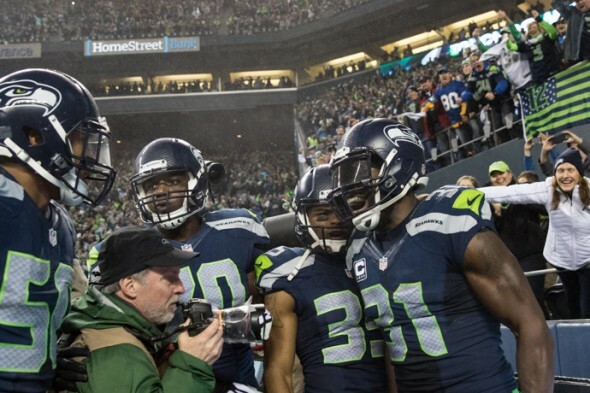 Kam Chancellor is back, and his teammates are happy to have him. To a man, that was the response in the locker room at practice Wednesday, where Chancellor showed up early in the morning after ending his holdout. Fellow defenders said they approached Chancellor’s situation as friends and understanding co-workers and did not blame him for the team’s 0-2 start. LB Bruce Irvin said he supported the business end of Chancellor’s decision to hold out. Cliff Avril echoed a similar sentiment, saying that he didn’t think Chancellor had overestimated his power to renegotiate after his re-upped contract last season. In Chancellor’s absence, the Seahawks surrendered back-to-back fourth quarter leads en route to an overtime loss to the Rams and a 27-17 loss at Green Bay Sunday. Defensive end Michael Bennett said he didn’t blame Chancellor for the Seahawks’ worst start since 2011. Still, everyone agreed that the defense would be stronger with Chancellor’s return. ”He’s an emotional leader, he’s a tone-setter and he’s one of the best safeties in the league if not the best,” said Irvin. “He’s going to go out there and do what he does, which is go out there and play hard and smack guys,” said Avril. Chancellor was in constant contact with his teammates through his extended holdout, and said that their encouragement played a large role in his return. Now that Chancellor is back, he’d rather avoid discussing his reasons for holding out so long. As much as missing training camp and one-eighth of the regular season and then not wanting to talk about why might smack of wanting to have your cake and eat it too, the organization has been consistent regarding its attitude in public regarding the holdout.